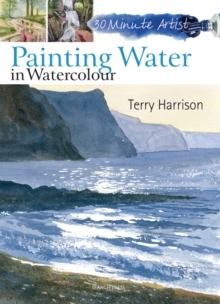 All watercolour landscape artists need to know how to paint water, and in this book Terry Harrison excels in demystifying the painting process. Here he shares his expert advice and no nonsense tips and techniques for producing quick, effective paintings of water. There are two- or three-step exercises for painting water in all its varied moods and situations, including ripples, reflections, puddles, streams, breaking waves, choppy water, surf, bridges, riverbeds, boats, and much more.